Since beginning the first Eco-Camp program in 1995, the Foundation has designed the camp experience to encourage alternative approaches to education and to foster a greater appreciation of the natural world. Children, families, and local school groups learn to work together and develop a powerful bond-with each other and with the natural world-through this series of educational and therapeutic activities. The Eco-Camp program also provides special healing programs for child prostitutes, abused women, and disenfranchised youth. By understanding and appreciating the lives of Indigenous people and those who make a living by utilizing natural resources, students develop a profound understanding of how all elements and people are interconnected. Students start to see the communities they live in with more sensitivity, compassion, and understanding. This helps to build a stronger sense of working as a community to build a better society. A Bed for Every Child – low-cost bunk beds for children sleeping on dirt floors. Basic Baskets (Canasta Básica) – Food baskets provided to low-income families. I Give You My Hand – Child to child support program to combat abuse. It’s Your Business – Consciousness raising program to confront child prostitution. 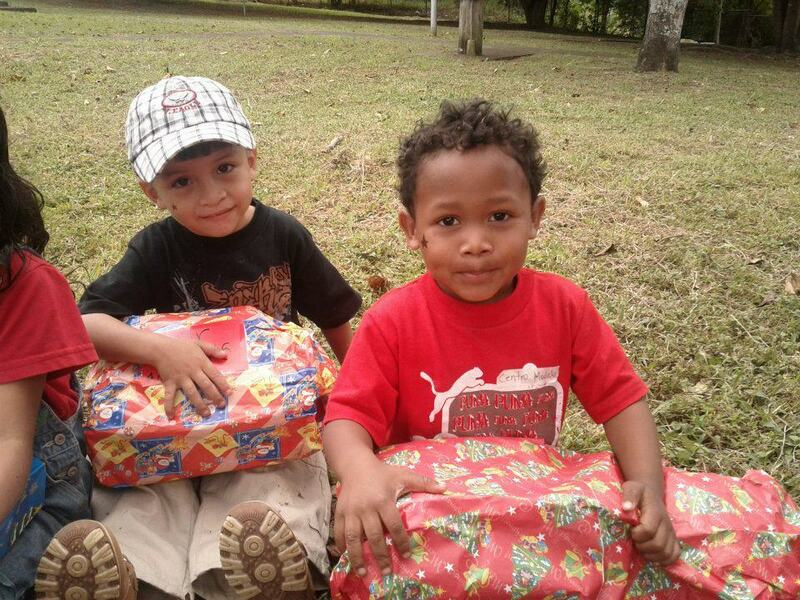 Holiday Party – Yearly holiday celebration for hundreds of wishful children. Rainy Day Boxes – Boxes with materials to entertain isolated children on rainy days. Shoes for Shoah – Distribution of thousands of shoes to people living in impoverished communities. Traditionally, the people of the Atlantic Coast of Costa Rican are eager for education and reading activities. Their roots are in the islands of the Caribean where family values, hard work and discipline are the custom. In past years, there has been an influx in this coastal region of outside influence. While some of this influence has been beneficial financially, a good deal of it has taught the youth to make “easy money” by being involved in illicit activities. Although the teachers and school directors of the area work hard to combat this attitude, it is difficult for them with the lack of resources they have. Our library program hopes to support the efforts of local educators to bring back reading, discipline and hard work to the schools. We want to show the students how books can teach and entertain and give information. In addition, our libraries will have lots of educational games and activities for students. We will also be giving art materials and supplies to the libraries so that children can develop their visual art skills. By providing a physical space for children and teachers to have these enrichment activities we think that they will begin to see how important these kinds of skills are for the full development of the students. In the neighboring Bri Bri indigenous reserves, there are no libraries and books are very hard to come by or when they are there, they are seldom organized and taken care of in a way that makes them attractive to pick up and read. Our program here hopes to motivate children and adults to continue their education by reading and researching to learn more. We also hope to identify children in the community who have special needs so that they can be supported more in their efforts to learn and become more independent. At the current time, it appears that there are more than 50 children in the BriBri reserve who have special educational needs. In our library we hope to provide the special materials needed for these children so that they can learn along with their classmates. Again, our art materials and supplies will allow the children to express themselves in ways that are non traditional and will provide a way to communicate with them. 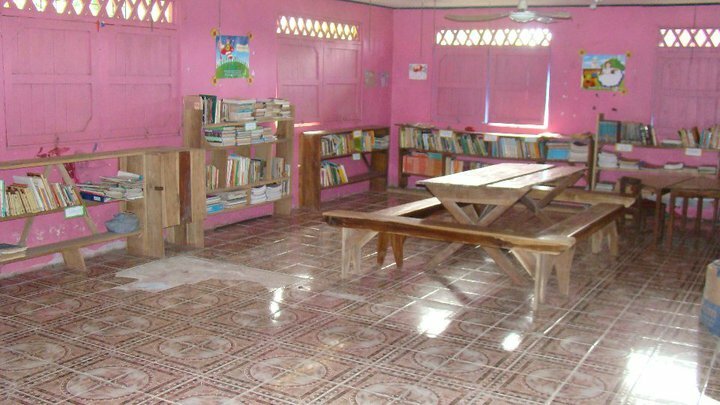 While working on these library projects, volunteers will stay at the Finca Educativa in Volio, a small village on the reserve about 25 minutes from the entrance to Puerto Viejo. This is a local community run center that includes clean, neat dormitories with space for four people each, a large dining area, two classrooms and a room which will become a computer center. We want to support the efforts of these local indigenous people as they teach us about their customs and their attempt to improve the quality of their own lives through their education of our volunteers.